Located only an hour south of the Twin Cities, Owatonna is a popular vacation getaway in Minnesota for nature and sports enthusiasts—even during the winter. It’s known for its variety of winter activities, and Owatonna sees a healthy number of visitors during its snowy season. From cross-country skiing, to snowbiking through Kaplan’s Woods, to skating on a frozen river, here are some of the top things to do in the winter in Owatonna, Minnesota. Grab your skates and head over to the frozen Straight River, a 55-mile-long tributary that’s part of the Mississippi River. This unique outdoor rink was featured in Explore MN’s Great Outdoor Ice Rinks. 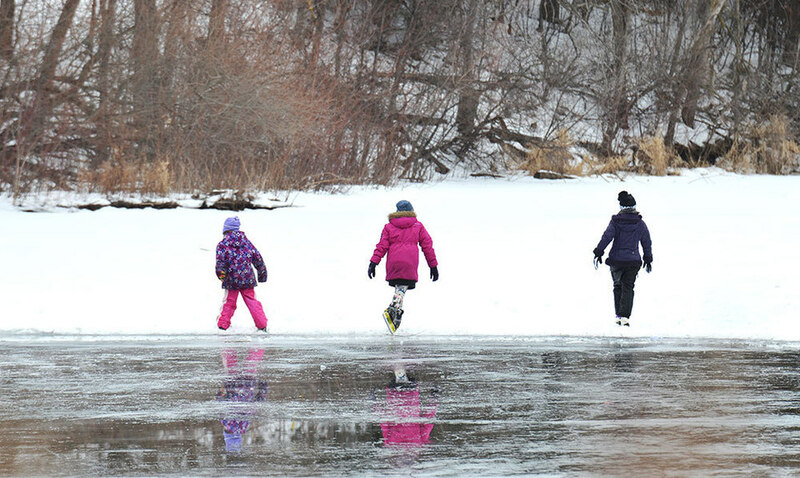 The river snakes its way into Owatonna, and during the winter, it becomes a magnet for seasoned and amateur skaters exploring the winter wonderland on a natural-made ice rink. If you don’t own skates, you can rent them from the Warsinksi Chalet at Morehouse Park near downtown Owatonna. The Warsinksi rinks at Morehouse Park are the only supervised rinks in Owatonna, and the chalet/warming house also rents out cross-country skis and offers snacks and place to warm up after a stint on the ice. Morehouse Park also hosts family bonfires on Saturday nights starting around 5:30 p.m.
Owatonna attracts visitors each winter from mid-December to mid-February to take advantage of its skiing accommodations. The area specializes in cross-country skiing with its large swaths of fairly flat trails to explore during the winter. Experienced skiers join relative newbies on a popular 11-mile trek through the snowy wilderness from Morehouse Park south to Kaplan’s Woods Parkway, a 225-acre recreation area. Cross-country skis can be rented at Morehouse Park. Those who want to keep going can trek another 10 miles from Kaplan’s Woods to the Country Club Golf Course and Brooktree Golf Course. Another popular wintertime activity in Owatonna is snowshoeing—a cousin to hiking that you can do on the snow aided with the help of snowshoes. In Owatonna, Rice Lake State Park is a popular destination for snowshoeing. There, you can rent the snowshoes and hike around the 750-acre snow-covered park. Rice Lake State Park was historically used as a wild rice harvesting area by Native Americans. Believe it or not, you don’t have to wait until spring to engage in your favorite two-wheel activity. Fat biking is a new winter activity in Owatonna—quickly rising in popularity—where cyclists can rent a fat tire bike that’s designed to ride smoothly on snow. Rentals can be made at Straight River Sports, and cyclists can join a one-of-a-kind scenic ride through the snowy wonderland on the Kaplan’s Woods mountain bike trail. If your children are getting older and want a little more adventure, consider snowmobiling—the equivalent of an ATV ride during the summer. Rice Lake State Park and Steele County Trail System are popular locations for snowmobiling. Steele County is a 175-mile route of groomed snowmobile trails that connects five adjoining counties. Snowmobiling is mostly geared toward adults or families with older children. Head over to the frozen Lake Kohlmier or Lake Chase for traditional winter ice fishing. If you’ve never tried it, ice fishing is pretty much what it sounds like: dropping a fishing line through an opening on a frozen lake to try and nab bluegills, crappies or bass that swim below. Ice fishing on Lake Kohlmier and Lake Chase is a a fun way for a family to spend an afternoon together. Steele County Four Seasons Centre has been an entertainment hot spot in Owatonna for both locals and visitors since 1972. It has two massive indoor ice-skating rinks available to the public. There, visitors can join or watch hockey games, live figure skating, and regular ice skating—which are planned out on the center’s calendar each season. It also lists times for open public skating and hockey. This is a just a snapshot of the things you can do in Owatonna during the winter. There’s plenty to explore indoors too, including shopping at Cabela’s World’s Foremost Outfitter and the Medford Outlet Center or visiting the Orphanage Museum and other famous historical sites and attractions. Download the Owatonna Visitor Guide now to find out all the other things to do during the winter and anytime of year in Owatonna, Minnesota.